WASHINGTON, DC, May 27, 2014 (ENS) – Rising sea levels, relentless floods and rampaging wildfires are destroying landmark historic sites around the United States, warns the nonprofit Union of Concerned Scientists in a new report. The 30 threatened sites detailed in the report include places where Native Americans lived, Spaniards ruled, English colonists landed, slavery rose and fell, and gold prospectors struck it rich. Some of the sites commemorate more modern “firsts,” such as the race to put the first man on the moon. 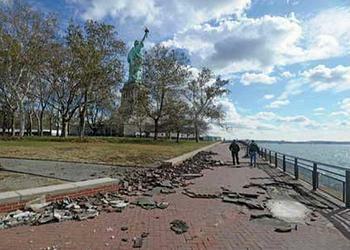 Jeff Altschul, president of the Society for American Archaeology, voiced a stern warning. “Climate change is eroding and will continue to erode our historic fabric, disturbing and destroying many archaeological, traditional, and historic sites that embody the values we cherish as a nation,” he said. Ten of the 20 highest tides over the last 100 years have occurred in the last decade, putting Boston’s historic sites at great risk. 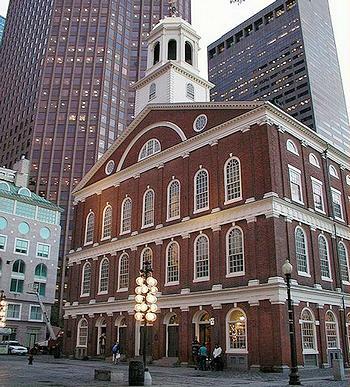 Threatened by rising seas are Boston’s historic Long Wharf; the Blackstone Block, a district of narrow, winding streets and alleys dating from the 17th century; and Faneuil Hall, a U.S. National Historic Landmark where Samuel Adams and other Sons of Liberty first met to plan the Boston Tea Party. The Organisation for Economic Co-operation and Development ranked Boston the eighth-highest metropolitan area worldwide in expected economic losses, estimated at $237 million per year, between now and 2050, due to coastal flooding. Jamestown, the first permanent English settlement in the Americas, is likely to be submerged by rising seas by the end of this century, as is the Harriet Tubman Underground Railroad National Monument in Cambridge, Maryland. Without taking steps to preserve access, other sites also may become inaccessible to the public as sea levels rise. “Fort Monroe in Virginia, which played a crucial role in the fall of slavery, will become an island unto itself within 70 years,” said Markham. Throughout the American Civil War (1861–1865), although most of Virginia became part of the Confederate States of America, Fort Monroe remained in Union hands and became an historic and symbolic site of early freedom for former slaves. Surrounded by a moat, the seven-sided stone fort at the tip of the Virginia Peninsula is the largest stone fort ever built in the United States. 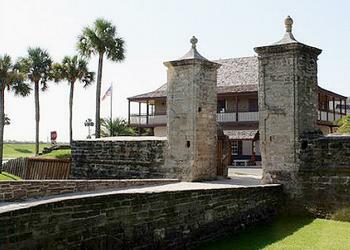 “Castillo de San Marcos, in St. Augustine, Florida, also is extremely vulnerable,” said Markham, citing the increasing flood risk to the National Monument, the oldest masonry, and only existing 17th century, fort in North America. National Oceanic and Atmospheric Administration projections show that, without major engineering feats, grounds immediately surrounding the fort will become permanently inundated with three feet of ocean water, the moderate range of what scientists expect will occur by the end of the century. The National Park Service is using three-dimensional scans and videos to better inform how the agency preserves the fort. Rising seas and the threat of worsening storm surges also are endangering historic districts in Annapolis, Maryland and Charleston, South Carolina and pre-contact Native Hawaiian structures on the Big Island of Hawaii. Meanwhile, in Alaska, melting sea ice and thawing permafrost have allowed winter storms to erode the coastlines at an unprecedented rate, affecting Cape Krusenstern National Monument and the Bering Land Bridge National Preserve in Kotzebue Sound. “Irreplaceable prehistoric artifacts are actually crumbling out of the shorelines in these Alaskan sites and washing out to sea,” said Markham. Cultural resources in the southwestern United States have been hit by a dual threat – intense, large-scale wildfires that are often followed by flooding rain events. “During the last decade and a half, massive fires have swept through Mesa Verde National Park and Bandelier National Monument and other southwestern sites, damaging ancient pueblo masonry, petroglyphs and pottery,” said Markham. “Heavy rains and the extraordinary floods that have followed some of these fires have caused even more damage, destroying trails, damaging adobe buildings and washing away vital archaeological resources. These sites face huge risks as the climate continues to change,” he warned. The damage caused by the 2011 Las Conchas fire and extreme rains that came after it are forcing the Pueblo of Santa Clara, – a federally registered Native American tribe and National Historic Landmark – to build retaining ponds before the monsoons hit this year. The cost of these ponds may push the pueblo into bankruptcy, but if the Pueblo does not build the ponds, nearby communities could experience destructive flooding. These 30 case studies were chosen for the report “because the science behind the risks they face is robust, and because together they shine a spotlight on the different kinds of climate impacts already affecting the United States’ cultural heritage,” the report states. “All of the case studies in this report draw on observations of impacts that are either consistent with, or attributable to, human-induced climate change based on multiple lines of scientific evidence,” states the Union of Concerned Scientists. The report also documents examples of efforts to protect historic sites and make them more resilient to climate change, including work at the Statue of Liberty, the U.S. Naval Academy in Annapolis, Maryland, and the Cape Hatteras Lighthouse, in Buxton, North Carolina, which the National Park Service moved inland to save from sea level rise. To slow the rate of change and give archaeologists, historic preservationists and land managers more time to protect these sites, carbon emissions must be reduced, says the Union of Concerned Scientists. “Cutting carbon emissions significantly and quickly can slow the pace of sea level rise, limit the temperature increases, and slow the expansion of the wildfire season,” said Angela Anderson, director of the Climate and Energy Program at UCS. In addition, said Anderson, Congress should fund President Barack Obama’s proposed Climate Resilience Fund, which could be used to help municipalities and businesses become more resilient to climate change. Society for American Archaeology president Altschul says our ability to protect these cultural treasures depends upon our ability to communicate with one another.